The course duration is four weeks, with one hour sessions each week. This method enables the meditator to practice daily between sessions to improve concentration. Meditation is not difficult but it does require learning some skills and implementing some regular practice. Week one consists of personal introductions, some group discussion on Meditation and Mindfulness and establishing the correct posture for each individual student. India provides cushions but chairs are also an option for those who are unable to sit unaided on the floor. 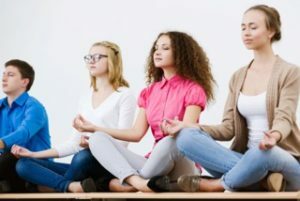 We practice a technique called “ the 9 rounds of breathing”, followed by a short meditation following the breath. Home practice is discussed. Week one consists of a “Candle Meditation”. In week two after a group discussion on the home practice, we talk about setting a motivation and dedicating the practice. We practice the 9 rounds of breathing followed by a 20 minute body scan. A USB is given to each student to enable them to practice the Meditation at home. Week three introduces a “Mindfulness Meditation” practiced as a group, along with an initial body scan and the 9 rounds of breathing. Each week builds the practice gradually so students are now able to sit and concentrate for longer periods. In week four we go outside and practice “Walking Meditation” then return inside for a “Visualisation” Meditation. Group discussion concludes the course. The course aims to offer as many different types of Meditation as possible. Students are individuals and feedback tells me they vary greatly in what they enjoy most. The course encourages daily practice , this is where the greatest benefit is achieved. Meditation is a great life skill and new meditators are often pleasantly surprised by the differences it makes to their everyday life. I believe that teaching meditation should begin with enabling the Teachers. Teachers are constantly regulating their emotions and they require a high level of self care and compassion to look after their students. This is the “oxygen mask” principle. First care for yourself so you can help others. If teachers can learn to work with themselves mindfully they will learn to teach mindfully. Parents and students courses follow. Teaching these skills to parents reinforces the school program. India offers courses to parents after or before school drop off or pick up and evening classes. Student classes can be arranged during school hours or after hours. Meditation helps relieve stress, anxiety and burn out. By practicing mindfulness we learn to become less reactive and our coping mechanisms improve. It improves concentration and learning skills and promotes compassion for self and others. Sleeping can also improve with Meditation. With anxiety and depression on the rise, meditation offers an appreciation of life and helps them build resilience and well being.